Ahead of you is an in-depth V-learning lecture on viral infections in children. If this is what you are waiting for, then this sqadia.com medical video lecture will provide you an elaboration of HIV infection, AIDS-defining illness such as pneumocystis pneumonia, lymphocytic interstitial pneumonitis, and Kaposi’s sarcoma. Moreover, cytomegalovirus and infectious mononucleosis along with neonatal herpes simplex and measles is discussed. Varicella and herpes zoster are also considered in this lecture. 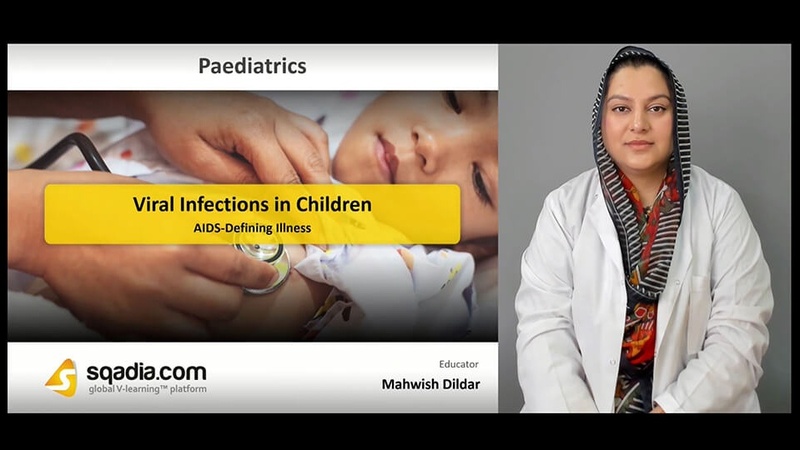 Dr. Mahwish Dildar explains the pathogenesis, aetiology, diagnosis, and also treatment aspect of all these diseases for more enhanced understanding of medical students. 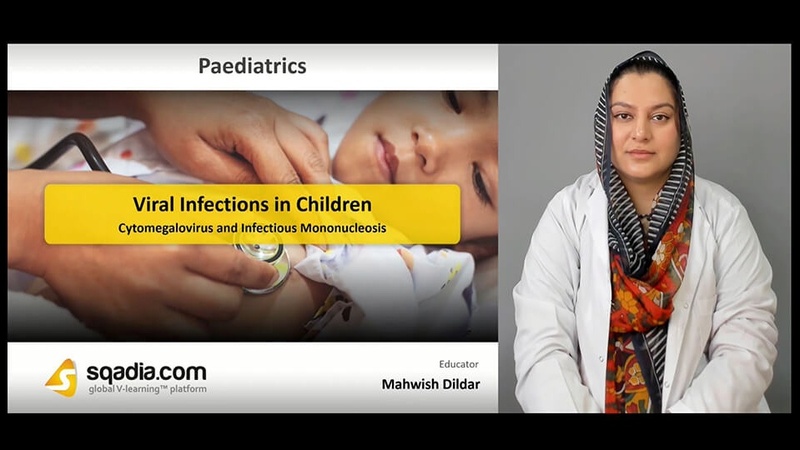 Besides that, Dr. Mahwish Dildar has also delivered medical video lecture on bacterial infections in children. 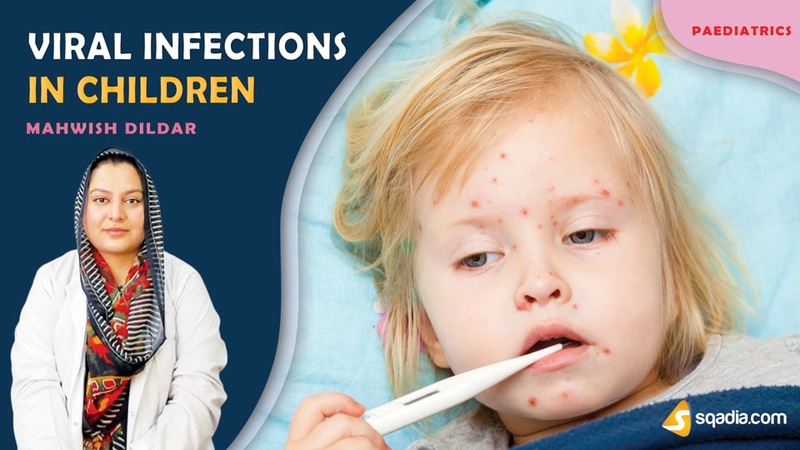 Stream the lecture on sqadia.com to differentiate between viral and bacterial infections in children and how to identify them. Human immunodeficiency virus (HIV) is a lentivirus that causes AIDS. Transmission of HIV takes place through blood transfusions and from infected mothers. Information about acute retroviral syndrome and AIDS wasting syndrome is also delivered. Moreover, detail about clinical presentation, diagnosis, and treatment of AIDS along with prognosis and prevention is discussed. Among the AIDS-defining illness, pneumocystis pneumonia is discussed initially. It is a type of infection of the lungs in people with a weak immune system caused by a yeast-like fungus. Next is the elaboration of lymphocytic interstitial pneumonitis which is a slowly progressive pulmonary disorder. Recurrent bacterial infections are the most common infections in which IgG2 subclass deficiency is observed. HIV encephalopathy, CMV retinitis, and Kaposi’s sarcoma are deliberated later on in this section. Congenital cytomegalovirus is a ubiquitous virus that only infects humans. Clinically presentation of CMV resembles blue berry muffins. Furthermore, infectious mononucleosis is considered which is a group of symptoms usually caused by the Epstein Barr Virus (EBV). Their aetiology, pathogenesis, diagnosis, and treatment aspect is elucidated thoroughly in the medical video lecture. Neonatal herpes simplex infection is the infection of neonate acquired during intrauterine, intrapartum or postnatal period. Clinical appearance shows vesicular eruption on skin. Measles is a highly contagious viral disease caused by the measles virus. After that, black measles is discussed. To know about how these diseases progress, how the diagnosis is carried out, their aetiology, treatment and what measure can be taken for prognosis and prevention, watch the full length medical video lecture on sqadia.com. In this section, varicella is discussed which is also known as chicken pox. Human herpes varicella zoster virus (VZV) is the causative agent of chicken pox. Pathogenesis illustrates that primary infection results in varicella. Another infection discussed in this section is the Herpes Zoster or Shingles. This infection results when varicella-zoster virus reactivates from its latent state in a posterior dorsal root ganglion.